The traditional boarding house was losing ground in the 'sixties and 'seventies. Licensed hotels though, were on the increase. Increasing numbers of people, who would have stayed at guest houses thirty years before, were choosing other forms of holidays, such as self-catering apartments or caravan parks. The growth in car ownership had, to a certain extent, made this possible. In the 'thirties, holiday makers generally went by train. In the 'sixties, the private car had all but taken over as the principle means of travel. Holiday makers could then stay away from the resort in a nearby caravan park and drive every day to the beach or town centre. Hoteliers were under attack at both the top and bottom ends of the market. They had to compete with both the caravan park and with the holiday abroad. In the 'sixties, package tours were starting to attract large numbers of people away for guaranteed sun on the continent. However, neither sector were able to significantly dent the market. At the popular resort of Torquay, for example, the number of hotel beds on offer rose by around 7% between 1957 and 1973 and the number of licensed hotels rose from 33 to 197. These factors, combined with generally higher expectations of standards, lead to a constant improvement in the quality of hotel accommodation in this era and a tendency for hotels to offer more rooms while the number of smaller guest houses declined. People were paying more and expecting to get more for their money. In many ways the 'sixties and early 'seventies were a golden age for seaside hotels. It was still the era when we liked a modern hotel to look modern. As well as offering more rooms, en-suite bathrooms and better facilities, hotels became modern in there appearance. Updating usually included a new interior in a typical 'sixties style. The Clifton Hotel, Scarborough has a typical late 'sixties or early 'seventies bar. The geometric wall paper, and vinyl studded bar are very period. The most important addition of all, was a new reception and lobby. Many hotels today still have 'sixties or 'seventies alterations heavily disguised to comply with the dictat that says to be tasteful everything should look old. Another favourite addition to 'sixties seaside hotels was a swimming pool, either a heated outdoor pool or an indoor pool. 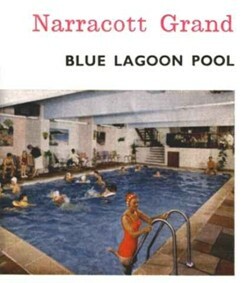 The Narracott Grand Hotel, Woolacombe offered a tropical indoor pool, heated to 80°F in 1965. It was overlooked by the "unique Casino Bar". There was ballroom and "Beat" dancing every night in the ballroom and Cabaret Bar. There were also film shows, a ladies' hairdresser, a games room and TV rooms. 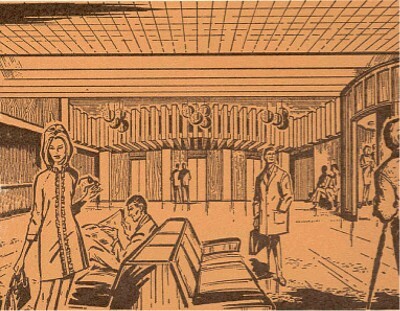 Special rooms for television were common in 'sixties and 'seventies hotels. It would have been rare to provide a separate television in every room. After 1969, many hotels boasted a colour television lounge. There is one particularly funny episode in "Fawlty Towers" when a guest attempts to persuade Basil to reserve the BBC 2 Channel for him. In the 'sixties, all AA and RAC classifications were the same. In 1960 to qualify as a 3 star, an hotel had to be well furnished, with a good standard of service. It was important to offer porterage at all times. It was not required to have hot and cold water in all bedrooms, although most would have to be so equipped. However, bathrooms had to be provided on all floors. A choice of dishes had to be available to both residents and non-residents, including hot food at "reasonable" times. By 1966, to achieve the same classification, at least 10% of bedrooms had to have a private bathroom, there had to be a separate television lounge and shaver points in all rooms. 1 star hotels were now expected to offer hot and cold running water in all rooms. Although many hotels were modernised for the 'sixties, there were very few new hotels built. 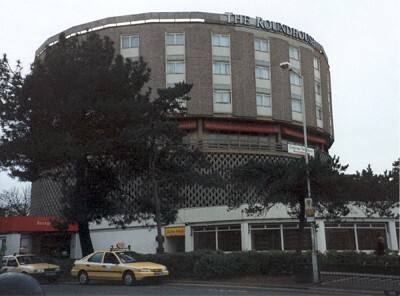 The Roundhouse Hotel, Bournemouth (left), which opened in April 1969, is an exception. It was built on the Lansdowne on the site of the old Imperial Hotel which had closed a few years earlier. The Roundhouse was the first major new hotel built in Bournemouth since 1938 and it was only the second large seaside hotel built since the War. The first was the Bedford Hotel in Brighton (opened in 1967) - built on the site of an older hotel of the same name. The Hotel was developed by Dekotel Ltd. The design is striking and modern. The cylindrical shape was very adventurous for conservative Bournemouth. The pebble dash concrete facings, picture windows with contrasting panels below and the honeycomb concrete car park on the second two floors are strong period details. There are rooms on both the inside and outside of the Hotel. The round design ensures a decent view of Bournemouth from most of the outside rooms. The Hotel itself portrayed an ambience of sophisticated modernity. This made the Roundhouse a fitting replacement for the former Imperial Hotel, which, when it opened in 1888, boasted one hundred electrically lit bedrooms and a night porter. 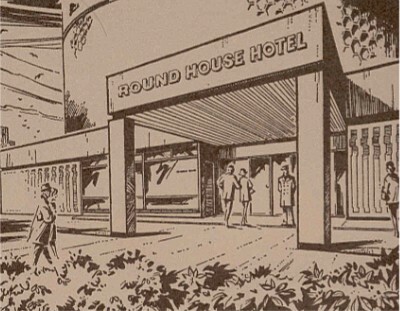 In spite of its resort location, the Roundhouse was aimed at the businessman rather than the holiday maker at the time. The ground floor of the Roundhouse Hotel contained the main restaurant, the cocktail bar, the saloon bar, a small coffee shop and the kitchens. Floors one and two were occupied by the spiral car park. The breakfast room was on floor three, along with the lounge, function rooms and a TV lounge. This was still the era when a separate television lounge was the norm. Televisions could be hired for use in the bedrooms for an extra cost (5/- per night or 30/- per week). There were bedrooms on the remaining three floors. They all had private bathrooms, radios and telephones, in addition to the television points. A single room cost 65/- in the low season and 80/- in the high season (that is roughly equivalent to 33 and 40 allowing for inflation). Rates were available for bed and breakfast and for "apartments" (room only). 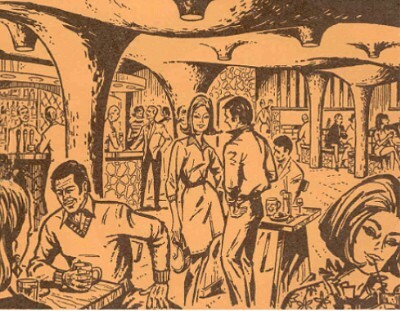 In the basement, there was the Cave Bar with its cavern-like decor (see above). This was an early example of a themed bar. It offered a cheese and wine bar and a snack bar, where hot and cold dishes were served at "moderate" prices. The Cave was the Hotel's public bar. The Hotel had two other bars - the Carousel - "elegant and intimate"; and the Forum - "relaxing and cheering". The Cave provided "adventure and intrigue"! 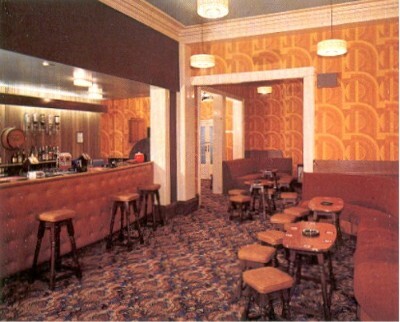 This is the sophisticated bar of the Coniston Hotel, Torquay in 1973. 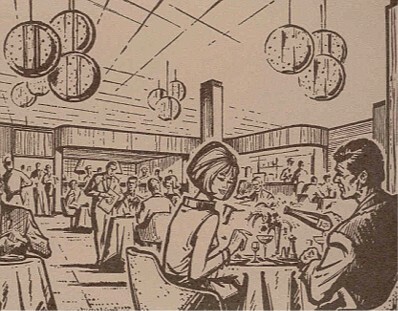 The Coniston was completely refurbished and changed beyond all recognition in 1973. As a ten year old staying there in 1977, I thought it was the epitome of style and good taste. New attractions included a heated outdoor swimming pool. The heated outdoor pool at the Coniston Hotel. I remember swimming in this pool in 1977. I did not stay in there long. Although it was in Summer, the heating had not been switched on, because no one had used the pool so far that year. Unfortunately, you can no longer visit the Consiston Hotel. It has been demolished and retirement flats have been built on the site. The Narracott Grand (now known as the Narracott Hotel), however, is open, although it has been modernised since this brochure was produced!